In CELAC-EU ministerial meeting, Minister Rodolfo Nin Novoa called for deepening the relationship with the European Union. 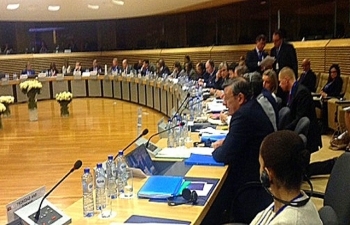 The Minister of Foreign Affairs Rodolfo Nin Novoa, who is in Brussels on the occasion of the Second Summit of Heads of State and Government CELAC - EU, participated in yesterday morning, in the meeting of Foreign Ministers Foreign CELAC. Later in the afternoon, the Meeting of Foreign Ministers of CELAC and the European Union, prior to the meeting of Heads of State and Government to be held on 10 and 11 June took place. At the meeting of Ministers of CELAC and the EU, Chancellor Nin Novoa, he stressed the historical, cultural, commercial and social ties between the two regions, with particular emphasis on the progress that has occurred in Latin America and the Caribbean economic, political and social inclusion. He also stressed the importance of bi-regional strategic partnership, whose origin took place in 1999, meaning that it should be conducted through three basic pillars, the political dimension, trade-economic and international cooperation. In political news, the Chancellor Nin said that both regions should have the real opportunity for consensus where possible to have a discussion, as equals, both on the main themes of the international agenda as well as on issues shared by the region , to find lasting solutions to them. In trade, while the network of agreements between the EU and several countries in Latin America and the Caribbean is wide, the Minister Nin stressed the importance for Uruguay has concluded the negotiations between Mercosur and the EU . Meanwhile in the area of ​​cooperation, advocated the search for common solutions with instruments triangular cooperation and regional programs to stakeholder demand and ensure attention to the real issues of national priority. Finally, Chancellor Nin, predicted that the Second Summit of Heads of State and Government is a new beginning for our historic relationship. CELAC ministerial meeting - EU concluded, entitled to signal the end of the negotiations of the Agreement Establishing the EU-LAC Foundation, between the Minister of Foreign Affairs of Ecuador Ricardo Patino (country holding the Presidency Pro Tempore of CELAC) and High Representative of the Union for Foreign Affairs Federica Mogherini. Uruguay expects that this new foundation is a tool for the promotion of bi-regional relations, boosting trade.